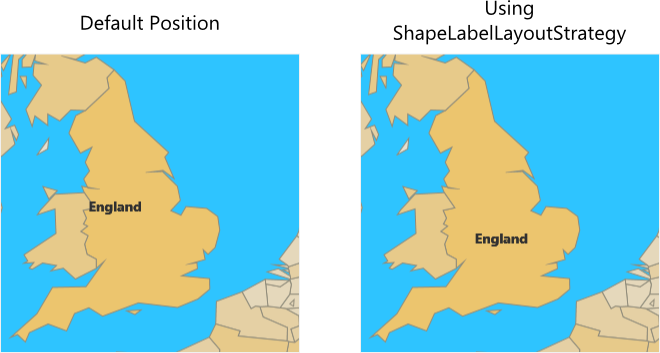 You can add a label for each shape in a MapShapeLayer by setting the ShapeLabelAttributeName property of the layer to an attribute from the *.dbf file specified in the Source property of the layer. Here is an example demonstrating how to add labels to the shapes. In the Label Styling sections you can find more information about customizing the appearance of the labels. The labels are positioned at the center of the shape they refer to, but sometimes the shapes have complex forms and their center is not the best place to render the label. In these cases, can use the ShapeLabelLayoutStrategy property of the MapShapeLayer class to adjust the label's position. The following example demonstrates how you can do that. First, you have to create a class that inherits from the MapShapeLabelLayoutStrategy class and override its ProcessCore method. Then set the ShapeLabelLayoutStrategy property of the MapShapeLayer to an instance of the created class. Here is comparison between the default label position and the custom label position.